Investigative reporter Nora Hesper spends her nights cloaked in shadows. As Indigo, she’s become an urban myth, a brutal vigilante who can forge darkness into weapons and travel across the city by slipping from one patch of shadow to another. Her primary focus both as Nora and as Indigo has become a murderous criminal cult called the Children of Phonos. Children are being murdered in New York, and Nora is determined to make it stop, even if that means Indigo must eliminate every member. But in the aftermath of a bloody battle, a dying cultist makes claims that cause Indigo to question her own origin and memories. 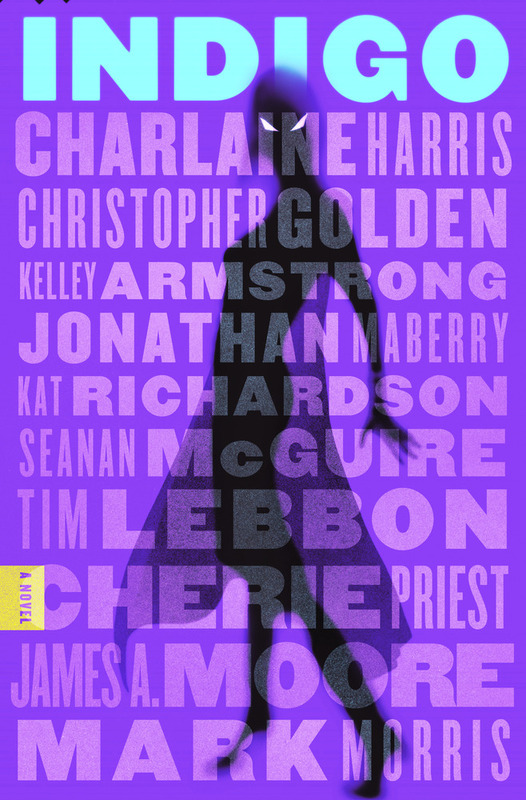 In a brilliant collaboration by New York Times and critically acclaimed coauthors Charlaine Harris, Christopher Golden, Kelley Armstrong, Jonathan Maberry, Kat Richardson, Seanan McGuire, Tim Lebbon, Cherie Priest, James A. Moore, and Mark Morris join forces to bring you a crime-solving novel like you’ve never read before. CHARLAINE HARRIS is a New York Times bestselling author who has been writing for over thirty years. She was born and raised in the Mississippi River Delta area. She is the author of the Aurora Teagarden mysteries, the Shakespeare mysteries, the Harper Connelly mysteries, the Cemetery Girl mysteries, and the Sookie Stackhouse urban fantasy series, which is the basis for the HBO show True Blood. Harris now lives in Texas with her husband. CHRISTOPHER GOLDEN is the award-winning, bestselling author of such novels as Ararat, Snowblind, Sons of Anarchy: BRATVA, The Myth Hunters, The Boys Are Back in Town, The Ferryman, Strangewood, Of Saints and Shadows, and (with Tim Lebbon) The Map of Moments. His original novels have been published in more than fourteen languages in countries around the world. JAMES A. MOORE is a co-author of the collaborative novel Indigo. JONATHAN MABERRY is a New York Times bestselling author and 5-time Bram Stoker Award-winner. He writes in multiple genres including suspense, thriller, horror, science fiction, fantasy, action, and steampunk, for adults, teens and middle grade. His works include the Joe Ledger thrillers, Rot & Ruin, Mars One, and Captain America, which is in development for a feature film. He writes comics for Marvel, Dark Horse and IDW and is the editor of such high-profile anthologies as The X-Files, V-Wars, Out of Tune, Baker Street Irregular, Nights of the Living Dead, and Scary Out There. He lives in Del Mar, California. KAT RICHARDSON is a co-author of the collaborative novel Indigo. KELLEY ARMSTRONG graduated with a degree in psychology and then studied computer programming. Now she is a full-time writer and parent, and she lives with her husband and three children in rural Ontario, Canada. She is the author of City of the Lost, the first book in the Casey Duncan mystery series. MARK MORRIS is a co-author of the collaborative novel Indigo. SEANAN McGUIRE is the author of the October Daye urban fantasy series, the InCryptid series, and other works. She also writes darker fiction as Mira Grant. Seanan lives in Seattle with her cats, a vast collection of creepy dolls and horror movies, and sufficient books to qualify her as a fire hazard. She was the winner of the 2010 John W. Campbell Award for Best New Writer, and in 2013 she became the first person ever to appear five times on the same Hugo ballot. TIM LEBBON is the New York Times bestselling author of the movie novelizations of 30 Days of Night and The Cabin in the Woods. He has also written many critically acclaimed dark fantasy and crime novels. Tim has won three British Fantasy Awards, a Bram Stoker Award, a Shocker, a Tombstone and been a finalist for the International Horror Guild and World Fantasy Awards.